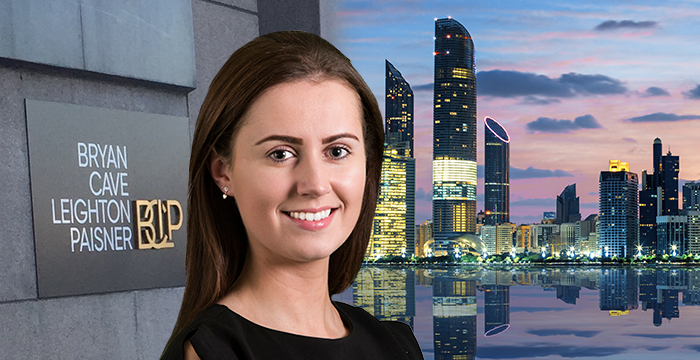 Fresh from a secondment in Abu Dhabi, Olivia Davies, a second-year trainee solicitor with Bryan Cave Leighton Paisner (BCLP), offers an intriguing piece of advice for aspiring lawyers. And if now, immersed in legal and social life at London Bridge-based global player BCLP, Davies doesn’t have time for her sport of choice — hockey — she says she still benefits from the lessons it taught her. A left-back for her university, Davies brought the same focus and determination that she showed on the hockey field to the business of becoming a lawyer. Davies went to Sheffield University straight after her A levels. After a gap year, she headed to the University of Law in Moorgate to complete an LLM Master’s Degree (which included the LPC). By this stage, Davies had already bagged a training contract with what would become BCLP — a global legal heavyweight currently co-chaired by Lisa Mayhew and Therese Pritchard. And so, albeit that she had toyed with the idea of the bar, Davies took the plunge and applied for a job with BCLP. She was thrilled to be accepted — and has enjoyed every minute of her working life, since she joined in August 2017. Video: What’s the best thing about being a brand ambassador at Bryan Cave Leighton Paisner?